Oranges are one of the most cultivated tree fruit in the world. They belong to the citrus tree family, along with lemon, lime and grapefruit. 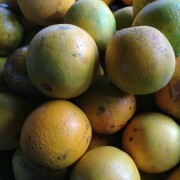 The oranges we eat are from the sweet orange (citrus sinensis) trees as opposed to the bitter orange trees (citrus aurentium). Sweet oranges are the result of a hybrid believed to be between a pomelo and mandarin cultivated in China as far back as 2500 B. C., there are no known wild orange trees. Orange trees were brought to Mediterranean regions by early Italian and Portugese merchants in 15th century, from there they were brought to the Europe and the Americas. Oranges trees are grown in tropical and subtropical areas for sweeter fruit. Orange production began in Hawaii with Archibald Menzies, a naturalist aboard the expedition ship Vancouver, who gave seedlings raised from orange seeds he got in South African to several leaders in Hawaii in the late 18th century. Oranges were grown in many regions in Hawaii, flourishing until a fruit fly epidemic hit in early 20th century. Those seedlings were thought to be of the Valencia variety, known now as Kona orange, as it was first cultivated there. Most oranges grown in Hawaii today are Valencia and Washington Navel varieties. Both known for sweetness, and seedlessness. Hawaii oranges are known for being not very pretty, but super juicy and sweet. Not being very pretty includes being a little on the green side or patching brown. The green though ripe look is due to the lack of cold nights here in Hawaii that give oranges their orange hue. Most oranges grown on industrial scale, unless organically grown, and found in supermarkets are dyed to give them a uniform “orange” look. Nutritionally, oranges are known for their very high vitamin C content and antioxidants. Orange season in Hawaii is usually December through spring. – It’s a good idea to wash your orange before peeling. – Oranges are great quick snack – just peel then segment, slice, quarter, half. – Oranges and their peels can also be preserved in marmalades. – Orange juice is also much used in glazes. Choose oranges that are heavy for their size, this connotes juiciness. Lots of people believe thin skinned oranges yield more juice than those that are spongy and lighter in weight. Oranges can be kept on the counter at room temperature or in the refrigerator for the same amount of time – up to ten days. Researchers have found that the closer oranges are to being nearly overripe, the higher the antioxidant content. Most important is to have them not be in a bag or sitting in one spot, as any exposure to or opportunity for moisture promotes moldiness. Oranges can be sliced and frozen for later use. They can also be juiced and their juice frozen in cube in an ice tray, stored in freezer for later use.